In 2006, over the course of three months, David Lyons went from experiencing a sharp pain in his left shoulder during a workout to intensifying agony and numbness in various parts of his body. Stubborn by nature, David assumed it was nothing more than a pinched nerve, and he followed his natural inclination that it wasn't a big deal. That is, until it got so bad he could barely move. When he was forced to consult a doctor, the initial—and incorrect—diagnosis was terrifying: brain cancer. This first doctor, a brain surgeon, told David that the operation he needed provided only a 50 percent chance of saving his life with a near 100 percent likelihood of lifelong paralysis. David wanted a second opinion. Over the course of his five-night stay in the hospital, his neurological specialist explored other possibilities. After a six-hour MRI, a spinal tap, and extensive blood tests, this doctor came back with another diagnosis: multiple sclerosis (MS). The death sentence had been commuted to life without parole; MS is both degenerative and incurable. The drugs approved to treat the condition can only manage it at best, and they come with serious side effects and health risks of their own. "After a six-hour MRI, a spinal tap, and extensive blood tests, this doctor came back with another diagnosis: multiple sclerosis (MS). The death sentence had been commuted to life without parole; MS is both degenerative and incurable." David prepared to face new challenges. First among them, his specialist told him that he'd need to use a walker at all times and that he'd be wheelchair-bound in the very near future. David refused to accept this fate. Instead he put his faith in God and the only kind of physical training he'd ever known: bodybuilding. Did you know there are 4 different disease courses in MS? Relapsing-remitting MS (RRMS): Characterized by defined inflammatory attacks (relapses) of worsening neurological function, followed by partial or complete recovery periods. RRMS is the most common disease course at the time of diagnosis, with approximately 85 percent of people with MS initially diagnosed with RRMS. Secondary-progressive MS (SPMS): This course occurs in people who initially had RRMS, and is characterized by steady progressive nerve damage or loss, with or without relapses. Primary-progressive MS (PPMS): Characterized by steady worsening of neurological functioning without distinct relapses or periods of remission. Individuals with PPMS tend to experience more problems with walking and more difficultly remaining in the workforce. Progressive-relapsing MS (PRMS): This is the least common for the four disease courses and occurs in approximately 5 percent of people with MS. People with PRMS experience a steady decline in neurological function, with occasional relapses like those experienced by people with RRMS. 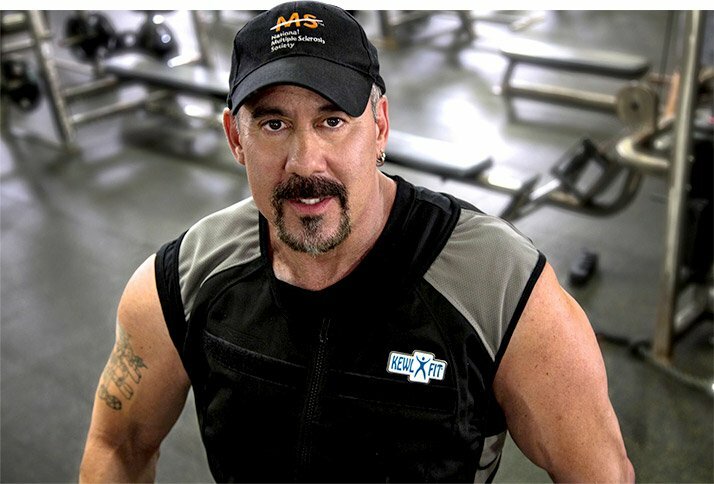 Today, at age 56, David is not only still able to walk without the assistance of a walker, but he continues to train like a bodybuilder on a daily basis despite the symptoms he battles with MS. He's published a book, "David's Goliath" (Leafwood Publishers, 2013), and is working on another aimed at people who face obstacles but want to be fit. 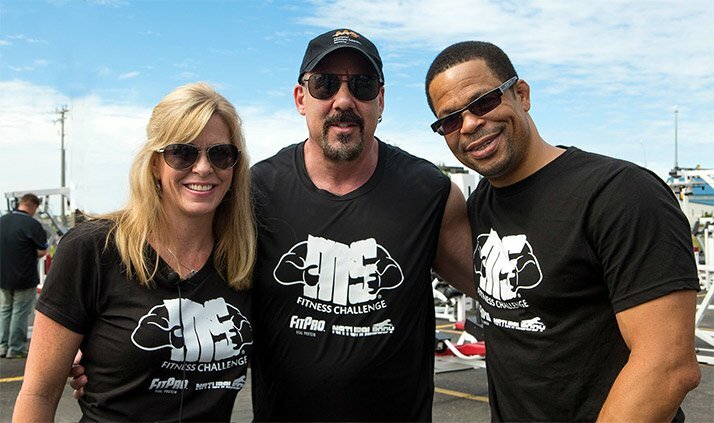 He's also launched the MS Fitness Challenge, a global initiative that supports others diagnosed with MS. Last March, David was awarded the 2015 Health Advocate Lifetime Achievement Award at the Arnold Schwarzenegger Fitness Expo in Columbus, Ohio. David sat down with Bodybuilding.com recently to tell us more about the MS Fitness Challenge; what's it like for a life-long bodybuilder to contend with such a progressive, debilitating disease; and what drives him to persevere. Most people have heard of MS, but they may not know what it does to people. How would you describe its pathology? Multiple sclerosis causes your body's immune system to attack the protective sheaths around your nerves. Without these lipid protectors, called myelin, your nerves are vulnerable, and they begin to "rust" like exposed metal left outside in the elements. Lesions begin to form at these points on your nerves, and this damage is irreversible. This nerve trauma then causes slow but progressive deterioration in your ability to move and function. Many people with MS also have short-term episodes, or relapses, in which they experience profound, debilitating flare-ups. The good news is that you can often improve from these occurrences and regain much—or perhaps all—of the function you had before one of these unfortunate events. The important thing to understand, though, is that MS only hibernates for a while; eventually it resumes its attack on the body. The long-term effects of this disease can be devastating. Tell us about your condition when you were diagnosed. Before I suffered the traumatic event that led to my diagnosis, I thought I was healthy in every way. But when I went to the hospital, I had no feeling from the chest down. I had to use my arms to pull myself out of the hospital bed. I could only maneuver through the room by stabilizing myself with anything I could grab. Otherwise, I was unable to control my body. What did you do when you got over the shock of being diagnosed with a degenerative, lifelong disease? Having talked to so many others with MS, I'd say that everyone responds differently, but after the normal "why me?" period of self-pity, I went into what I'd call stubborn denial. I refused to give in to my prognosis. I was determined to live a "normal" life, despite my condition. That's when I met my perfect companion, Kendra, on Christian Singles. She also happens to be a registered nurse, so she knew exactly what she was committing to when she married me in 2009. Together you then founded the MS Fitness Challenge (MSFC). Tell us about that. We founded the organization in 2013. I want other people with this disease to get off the couch and take an active role in fighting it with the help of a qualified support team. Over the last two years, we've reached people all over the world. The purpose of the MSFC is to raise awareness about the importance of fitness in helping people overcome the challenges that come with the disease and slow its progression. "The purpose of the MSFC is to raise awareness about the importance of fitness in helping people overcome the challenges that come with the disease and slow its progression." We're focused on educating people on the benefits of health and fitness in combatting MS. In addition, we provide certified fitness training, nutritional advice, and supplements. The MSFC pays for trainers and provides free membership at a fitness center for local individuals with MS who participate in one of our 12-week challenges. We rely on donations from supporters and business sponsors to fund this—many people with MS can't afford this on their own, and medical insurance doesn't cover gym memberships or personal training. Beyond the financial limitations, are those with MS reluctant to exercise on their own? It's not that they're reluctant, exactly. But many people with MS have experienced a profound physical decline, and they may be fearful of going to a gym and lifting weights or performing cardio on their own. In fact, some simply aren't capable of doing this on their own. Those of us with MS tend to have trouble with balance, and we have nerve damage, which makes it difficult to fully experience the sense of touch. In fact, I injured myself in 2008, tearing my pectoral while bench pressing because I wasn't aware of feedback from my body. Having a qualified trainer provides someone with not just a spotter but an educator. This can help someone with MS train within their boundaries while reducing some of the risks and maximizing benefits. What benefits can those afflicted with MS derive from training? Because a person with MS doesn't get as much feedback from their body as other people do, they're prone to muscle atrophy. But strengthening muscles helps improve balance and coordination as well as helping to increase muscle mass, which also helps decrease body fat. Depression also can be a very real part of life with MS. People with this disease have to face the reality that tomorrow may be the day they will never walk again. We have to deal with the uncertainty of changing symptoms, unpredictable pain, and numbness. But when someone with MS begins an exercise program, a sport, or any form of daily activity, they're taking their mind off the disease and engaging in something positive. Nothing is more psychologically healthy—and ultimately, physically beneficial—than pursuing something that draws attention away from the condition. How many MSFC events have you held? We've already held five challenge events in gyms, and we have a few more scheduled later in 2015, with two follow-ups in Aurora, Colorado, and Orlando, Florida. [Previous MSFC events have been held in St. Cloud/Sartell, Minnesota; Orlando, Florida; San Diego, California.] Ahead of the events, we enroll people online who have MS, and Kendra conducts personal interviews to make certain they can attend the challenge in their city. MSFC is promoted with the outreach of the National MS Society. This organization has been a tremendous ally. But we also have the support of local MS groups and an MSFC ambassador in each event city. We start with a kick-off day to launch the 12-week challenge. This includes media coverage and meet-and-greet booths in which sponsors have the opportunity to share their products and services with the local community and their families, fitness enthusiasts, MSFC supporters, and gym members. MSFC participants are matched with trainers who meet their needs, and they work one-on-one for the course of the 12 weeks. Many of our trainers have worked with MSers before, and others have years of fitness experience and the patience to become a part of this program. There are no winners or losers in the challenge—just a platform for people with MS to challenge themselves in the gym. "I love bodybuilding and wanted to make a career with it, but competing doesn't pay, so I spent my time opening gyms and running them. I finally did step onstage in the early '80s in Massachusetts, placing fourth." MSFC and its director of trainer certification, Mark Mueller, are working hand in hand with the American Fitness Professionals Association (AFPA) to offer an MS specialty certification. This course will be specific to educating trainers on the daily and fluctuating challenges of those with MS, as well as the most effective and safest ways to work with these clients. This certification is groundbreaking in providing a credential to trainers who have the desire to work with MSers. Our organization calls these professionals 'Trainers with Heart." We expect this course to be available this summer with further announcements on our website, Facebook, Twitter, and the AFPA website. Exercise is an important component to managing MS symptoms. Studies have confirmed the benefits of exercise for individuals with MS, including improved physical fitness, cognitive function, and quality of life. Here are some specific tips for exercising from the National MS Society. Consult your physician before beginning any exercise program. An exercise program needs to be adjusted for your capabilities and limitations. It may have to be adjusted over time as your body changes as well. Exercise should be timed to avoid the hotter periods of the day, to prevent excessive fatigue. Drink plenty of fluids to stay hydrated. Exercising in water may provide unique benefits and allow you to move in ways you might not be able to on land. Besides feeling lighter in water and supporting weak limbs, movement takes less effort and you move more slowly through water. The water temperature may also help keep your core temperature cooler. Keep cool by dressing in layers so you can be comfortable without overheating. Find an activity you enjoy; you're more likely to stick to it. Breaking your physical activity into 20-minute segments is one way to achieve the benefits of physical fitness. Avoid exercising to exhaustion. Take breaks to recharge if you feel the need. Training with weights is an option for many people with MS. Modify exercises and weights as needed. Because MS can affect balance, training with an exercise ball can help your body's stronger systems compensate for its weaker ones as they relate to coordination and balance. Tell us a little about your own bodybuilding story. I started training when I was in my early 20s, and I've been training almost every day for more than 30 years. I love bodybuilding and wanted to make a career with it, but competing doesn't pay, so I spent my time opening gyms and running them. I finally did step onstage in the early '80s in Massachusetts, placing fourth. At my peak, I weighed 230 pounds at 5-foot-10, and I was ripped at 210. That was pretty big back in the day. I've always had tremendous respect for competitive bodybuilders because I understand the sacrifices they have to make. Despite my lifelong devotion to bodybuilding, I didn't compete again until 2009, three years after I was diagnosed with MS.
That was the MS Bodybuilding Challenge, a show you organized. What happened there? This was my personal challenge to prove I could beat MS, and I was competing at 50 years of age against many healthy men far younger and bigger. But the admiration I received and the brotherhood I felt overwhelmed me. When I posed, the crowd cheered me on despite my unstable legs and rough routine. 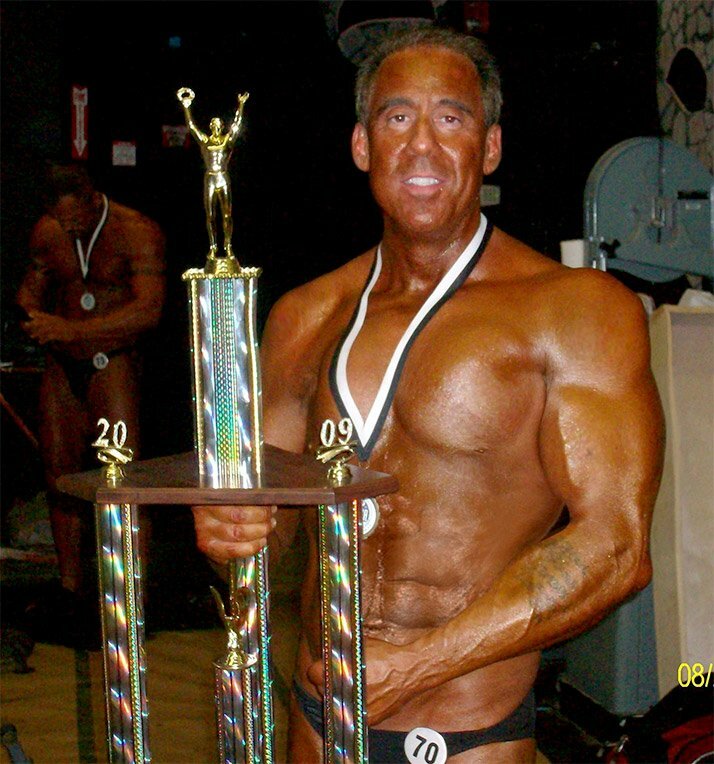 I was presented the Most Inspirational Bodybuilder trophy. After the contest, a number of competitors approached me with words of congratulations and thanks for inspiring them. I walked away a winner in my heart. That led to publishing your first book. How did this come about? I didn't set out to write a book, but I was approached by Leafwood Publishers, a faith-based publishing company. They thought my story was worth telling. That opened doors to other people, including [television personality] Montel Williams, who has MS and endorsed the work. "David's Goliath" can be purchased through outlets including Barnes & Noble and Amazon. 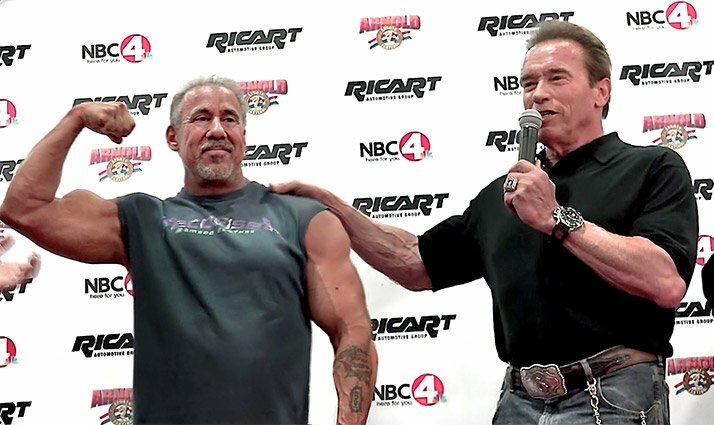 As a longtime bodybuilder, how big a deal was it to receive the Health Advocate Lifetime Achievement Award from Arnold? I prepared for the ceremony like I was prepping for a contest! I trained, dieted, tanned, and pumped up as though I was going to compete. With MS and now 56 years old, I was undertaking a huge challenge. But when I got to Ohio, I was in great shape thanks to the help of my coaches, IFBB pro bodybuilder Chris Williamson and pro natural bodybuilder Eric Broser. Is there a message you'd like to leave Bodybuilding.com readers with? When I was first diagnosed with MS, I couldn't follow my doctor's advice to take it easy. My gut told me I had to move, and I had to continue my training even though I was lying in a hospital bed numb from the chest down. I wanted to get better, and I wanted to inspire other people with MS. I firmly believe you have to fight back. Otherwise, MS can have a devastating effect on your emotional and physical well-being. I encourage everyone with MS to fight back against this disease through fitness and health. To support the MSFC please visit http://msfitnesschallenge.com/donate.html. To find out more about challenge events please visit www.msfitnesschallenge.com.